Writing letters in a foreign language can be daunting. This is a guide to what you should use for Spanish business and personal letters. Learn how to write them with well constructed sentences that are grouped according to themes like announcements, essays, invitations. Use other books from "Learn Spanish 4 Life Series" to improve your learning. Spanish letters are not just about linguistic competence. Effective communication in Spanish is also about cultural knowledge and knowing more about Spanish culture and Spanish people will help you to get a deeper insight into the Spanish Language. We will guide you and show you, with examples, how to express yourself and interact with others in a written format for both personal and business applications. When writing formal letters to a person you don't know or in a business context, there are certain conventions you need to follow. This book has been designed as a tool for non-native speakers to show you hundreds of phrases and expressions grouped according to the function that is being performed when writing and responding to Spanish letters. We cover some of the most notorious areas of difficulty: announcements; invitations; arguments; approval; disapproval; certainty, possibility and capability; explanations; apologies; permissions; commercial; thanks; wishes; arguments; agreements; likes; dislikes; preferences; intentions; desires; requests; comparisons; suggestions; advice and many other topics. 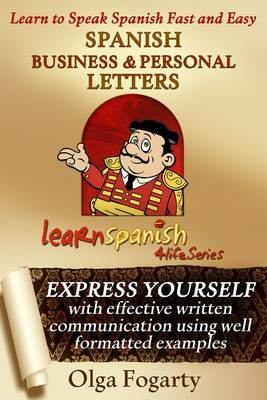 Use this book in conjunction with others from the "Learn Spanish 4 Life Series", and you will really begin to feel confident when you communicate with Spanish people for business or personal letters.